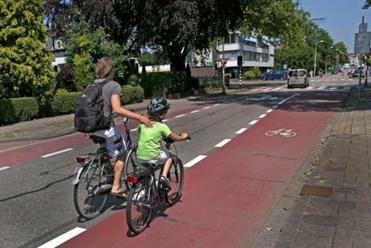 By innovating ways for cars and bikes to share the road, the Dutch have set the safety standard. HOUTEN, the Netherlands — The intersection at De Koppeling Street is the kind of sight that might render a Bostonian speechless. The top level functions like a normal rotary, cars entering and leaving from four directions. That bit of controlled chaos New Englanders know well. But on a level just below the cars, there’s another rotary, this one is just for bikes. As cars flow through the circle overhead, a steady stream of businessmen and moms and 12-year-olds wend their way through the intersection on their bicycles, safe, separated from cars, and undisturbed. It was enough to draw stares from four visiting Northeastern University civil engineering students who gawked from a grassy shoulder, taking photos on their iPads of this gleaming vision from a bicyclist’s Oz. Accidents are followed by detailed investigations, street redesign, and criminal prosecution on a level wholly different from Boston. Read: Quiz: Could you pass a Dutch bicycling exam? To the average American, that’s exactly how Dutch bicycle traffic seems. This is a place with more bikes than people, where about 26 percent of commuting trips are taken by bicycle, where toddlers and 85-year-olds ride happily in traffic, and where the likelihood of getting killed on a bike is among the lowest in the world, about five times less than the United States. It’s the kind of European fantasy that sure as heck would never work in Boston. 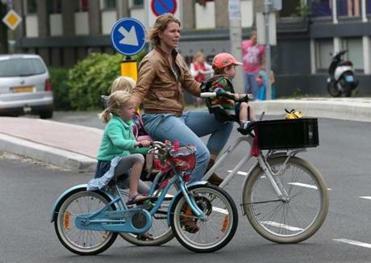 In the Netherlands, almost no one rides with a helmet, and families pedal along without worry about cars. As local transportation officials and engineers work to improve safety for Boston’s cyclists, they’re starting to realize that the things we think make Boston bad for bikes — cramped streets, crowded roadways, a desperate need for parking spots that leaves little room for bike lanes — are exactly the factors that made the Dutch bicycle revolution possible half a century ago. In fact, politicians, government leaders, and urban planners in Boston are increasingly looking to the Netherlands to figure out how to improve bike safety, and with it, bike usage, at home. Largely, American planners inspired by the Dutch experience have taken an “if you build it, they will come” approach: If American cities invest the money to redesign their roads, transportation experts say, children, senior citizens, and men and women in suits will try out cycling. But the Dutch have another lesson to share: Better bicycle infrastructure isn’t enough. You need better cyclists, too, and more bike-aware motorists. Universal in-school bicycle education guarantees that every Dutch child can comfortably ride in traffic. By the time they get their drivers’ license, they’ve used bicycles as their primary form of transportation for years — and that habit continues into adulthood. In short, the answer to replicating the Dutch bicyling success in America might be a lot more complicated than building better bike lanes. Living in bicycling nirvana leads many people — especially the young Dutch who have known nothing else — to believe it has been always been this way. For decades, here as everywhere, the car reigned. It was only after years of political protest about pedestrian and cyclist deaths, and a climax of concerns about oil dependency, that the Dutch changed their ways. Bike-riding had long been a mainstay of Dutch society, but attitudes shifted as the economic rebound that followed the conclusion of World War II brought on new cultural cravings. Wealth and babies boomed. As Dutch families moved to the suburbs, cars became less a luxury and more a middle-class necessity. Highways were built, sidewalks narrowed, and room for bicycles was eliminated. Politicians suggested filling in the city’s famed canals to make room for more parking spots. And as driving increased, so did collisions with pedestrians and bike riders. In 1950, just over 1,000 Dutch cyclists and pedestrians were killed in traffic accidents. By 1973, that number was about 3,250 — many of them children. Parents, especially, were fed up. “STOP THE CHILD MURDER,” read signs held up by protesters who poured into the streets. On one of Amsterdam’s most congested thoroughfares, hundreds laid down in the street next to their bicycles. Then, in response to the 1973 oil crisis in the Middle East, Amsterdam mandated car-free Sundays to curb oil consumption — and to their surprise, people liked it. It was so popular, many towns closed their city centers to car traffic permanently. Soon, car lanes were narrowed to introduce separated lanes for bicycles. And just like that, the bicycle was back in business. Or somehow take what he was seeing home. Since that first trip to Amsterdam, he’s been studying Dutch bicycle infrastructure, dividing his time between Boston and the Netherlands, and figuring out what elements of street design have led residents to ride in droves. Now, he brings a Northeastern civil engineering class here each year with the goal of bringing those answers back to Boston. Seeing is believing, he says. By changing the street design in a city, he believes, you will change how people live their lives. Bostonians who thought cycling was outside their depth — old people, children, professionals, commuters from the suburbs — will see how bikes can be integrated into their lives: grocery shopping, ferrying children to soccer practice, taking business lunches. Rule number one of Dutch cycling: If you want regular people to ride bikes, you’ve got to separate them from the cars. That’s according to Jeffrey Rosenblum, transportation planner for the city of Cambridge who, along with Furth, is co-teaching the Northeastern class. He explains: For years in the United States, bike lanes — a strip of paint suggesting a delineation between cars and bikes — have been the gold standard of bike infrastructure. But Rosenblum sees bike lanes as just the start. Enter cycle tracks, a Dutch staple. Cycle tracks are dedicated lanes physically separated from cars. The barrier can be a curb or semipermanent plastic posts, or even potted plants. Paula Overvoorde, 71, takes her bicycle most days to pick up groceries at a local market. A prim woman with pearl earrings, she packed cheese, milk, a sack of potatoes, lettuce, tomatoes, and a long loaf of bread into the carrierattached to the back of her bike. With cycle tracks spanning the 2-mile route from her home to the grocery store, she rarely rides alongside cars. Some Dutch cycle tracks are also built at the same level as the sidewalk, separated from traffic by the curb. For cyclists, being closer to pedestrians makes for a more enjoyable ride: They don’t feel that they need to race to keep up with cars speeding by. And according to Constable Tommy Hamelink, head of the Hague Police’s bicycle unit, drivers like the cycle tracks, too: They prevent cyclists from unexpectedly weaving into a car’s lane. With 21,000 miles of separated bike facilities in a country a little larger than Massachusetts and Connecticut combined, the cyclist demographic looks different: Instead of solitary road warriors streaking down a bike lane, you see couples holding hands while cycling side-by-side. Parents riding next to their children, a hand on the kid’s back to guide them along. Moms riding bakfiets, or “box bicycles” — bikes with a wagon attached to the front — with their kids snoozing inside. Rosenblum and his family — all staying in the Netherlands for the duration of the class — found it exhilarating. The family rides often when at home in Cambridge, but it’s always stressful. “When I take the kids somewhere on the bike, I always have to think very carefully and strategically about what route I’m going to take, because there are so may routes I want to avoid,” said Rosenblum’s wife, Jessica Kuh. There are other ways, Rosenblum says, that Dutch transportation officials make roads safer for bicycles: lower city speed limits for cars; encouraging cyclists to use less-congested roads that run parallel to major car thoroughfares; and establishing “bike boulevards” that give right-of-way to bicycles. When it’s not possible to completely separate the bike track from the cars, traffic engineers try to at least separate cars and bikes as they cross an intersection. Placing small islands in each corner creates a buffer between cars and bicycles at traffic stops; the increased space provides a driver turning right more time to notice, and brake for, a bike going straight through the intersection. Additionally, Rosenblum said, there’s a way to crack down on the biggest complaint among Boston drivers: Cyclists who ignore red lights. Bike-specific traffic lights are common. And at intersections with these bicycle-shaped signals, something happens in Amsterdam that rarely occurs in Boston: Cyclists stop and wait. The city has had huge success with bikes, even for the Netherlands — more than half of all trips are taken by bicycle or on foot. All high-speed car traffic is confined to two converging ring roads that form a figure 8 around the city. Speed limits are kept low on residential roads. Narrow streets with few connections mean that bikes are the only way to travel quickly and reliably through the center of town. Experts say the town’s enthusiastic embrace of cycling is the result of the government pouring so much money into infrastructure. Last year, they spent a rate of about $42 per person to maintain and improve bike facilities. It’s a cut above Amsterdam, which spends about $39 per resident per year, or the Hague, where it’s at least $27. And how much does Boston spend? $1.92 per person. Cambridge, Somerville, and Brookline aren’t much better. Of course, the Netherlands has a whole lot more money to throw at bike engineering. Costly urban ills we take for granted are rarities — the country’s homicide rate is 10 times lower than that of Boston. In Houten, the city’s transportation planner jokes, the town’s three biggest problems are speeding mopeds, uncollected dog poop, and loitering teenagers. The low spending levels in Boston frustrates Furth. Key intersections in Allston, the Back Bay, and elsewhere could be so much safer if the investment was made to improve them. He also believes Boston’s street designers would benefit by emulating the innovative spirit of the Dutch. Near the western town of Scheveningen, transportation officials have even experimented with paving gentle asphalt waves in the road to slow speeding cars without impeding bicycles. Jesse Boudart of Portland State University, a teaching assistant on the Northeastern trip, says American engineers too often feel hemmed in by their design handbooks — the bibles of the civil engineering world, which provide a menu of options engineers can use when redesigning streets. But one of the most widely used American manuals has been notoriously slow to warm to new bike facility options. Simple bike lanes, in fact, only made the book last year. Cycle tracks, bicycle corner islands, bike-specific traffic signals — none are included. “Engineers that go out on a limb . . . that’s where you can get sued. That’s a big problem for innovation,” Boudart said. Fresh thinking comes easier in the Netherlands, said Jan Nederveen, a city planner and transportation expert for the city of Delft. There are handbooks, to be sure, but also a spirit of flexibility. “We like to experiment in Delft,” he said. Peter van Rijn, a Rotterdam University engineer, standing before the Northeastern students, wanted to make sure they all got one crucial, contrarian-sounding point. The key to bicycle safety, he said, had little to do with the design of the streets. The Netherlands is a nation of expert bike riders, where children learn not just how to ride a bike, but how to ride a bike in a traffic system alongside cars, pedestrians, and public transit. Esther Saraber, a 37-year-old consultant living in Delft, bikes her three sons to school every morning. Up until recently, she carried her youngest in a box bicycle, the ones with the wagon in front, known as the minivan of the bike world. But Saraber’s son turned 4 recently, and though he enjoyed the view from the comfy carrier, she put her foot down: He needed to ride to school on his own bike. Sure, she said, she and her family enjoy cycling. But the enjoyment, she said, is secondary; because the bicycle is a primary mode of transportation, it’s a necessity that her child learn to bike safely. Heliante Kuster, who has taught at Delft’s Basisschool De Ark, an elementary school, for more than 30 years, says that bike training is a fundamental part of the school experience. In the playground, a miniature bike rack holds dozens of tiny bicycles that the children have used to get to school alongside their parents. Inside the classroom, posters advertise bike riding and bike safety. When the school goes on field trips, they go on bikes — riding down a cycle track in a large group, decked out in matching highlighter-colored vests. What they learn in school is not just how to bike, but also how to participate in traffic, Kuster says. And then there’s the big milestone: The bike diploma. For most, the rite of passage comes at about 12 years old. First there’s a written exam, in which students must answer multiple-choice questions on the rules of the road. Then there’s the practical portion: The children take to the roads, signaling their turns and stopping for cars as parents and teachers look on, evaluating their performance. After they pass, parents and teachers allow them to travel to and from school on a bike without adult supervision — total freedom. Kuster says she worries about the few children who are dropped off to school in cars. They don’t get the ingrained sense of how to navigate in traffic that comes with riding to school every day in a carrier on the front or back of their parents’ bicycles. That’s why school instruction is so important, she said — it ensures that cycling remains a mode of transportation for everyone. And it’s a skill that transfers to driving. Interactions between drivers and cyclists are less fraught with hostility largely because every motorist on the road knows what it’s like to ride a bike in traffic. Driver’s license exams, too, are part of the equation. Questions on the written exam are geared toward knowing how to interact with a bicycle. In the practical exam, drivers invariably cross paths with bikes. The last task of the exam is opening the driver’s side door. Drivers are required in the exam to use their right hand to open their door, which forces them to turn their torso. That makes it more likely they will look over their shoulder to check for oncoming cyclists who could get doored. Fail that part of the exam, and you could very well fail the whole thing. John Kartodikromo, who emigrated from Indonesia when he was a teenager, now works as a valet attendant in a Delft bicycle parking lot. The 35-year-old didn’t grow up riding bikes and missed out on in-school lessons as a child, but being surrounded by so many seasoned cyclists led him to adopt cycling as his primary mode of transportation. From the podium of Houten’s city council chambers, it would have been easy for urban planner André Botermans to declare to the Northeastern students in the audience that his city’s “bike heaven” reputation is a uniquely Dutch success. But he insisted that Houten isn’t all that different from the United States. Most Dutch families still own cars — relying on bikes for short trips and cars for longer distances — and he’s OK with that. That’s what makes the Netherlands experience relevant to American cities. By focusing on both street design and education, Botermans said, he thinks Americans can, and will, move toward a more bicycle-centered culture. And just as in the Netherlands, he said, that shift — both in infrastructure and in cultural sensibility — will be gradual. After returning to the United States in August, Rosenblum said he’s felt equal parts inspired and daunted. The cycling boom in the Netherlands, he says, shows what’s possible in Boston. But he agrees that Boston is a long way from the needed cultural shift. At an August public meeting in South Boston about bike lanes on West Broadway Street, the tone was vitriolic. Rosenblum said it’s hard not to get discouraged when he hears of such adamant anti-bike sentiment. Martine Powers can be reached at mpowers@globe.com. Follow her on Twitter @martinepowers.